By Zack Quaintance — Maybe I’m suffering from recency bias, but I’m hard-pressed to think of a summer in my life (I’m 22 give or take...SEVERAL years) as good for comics as this. Seriously. There are top-notch stories being told at both major superhero publishers—with characters ranging from Mister Miracle to Captain America—while the creator-owned market hits unprecedented peaks for variety and quality. Being in the midst of this wave is a blessing and challenge for writing lists like this. Obviously, I don’t lack titles, but it’s tough to narrow things down. I recently faced the same dilemma sorting the Best New #1 Comics of July. My answer is do it and spend the next month regretting choices. Act recklessly and then deal...that’s a strategy I’ve long employed. Joking aside, I put a lot of thought into this month’s list, agonizing until I landed on the titles below. Sooooo—let’s do this! 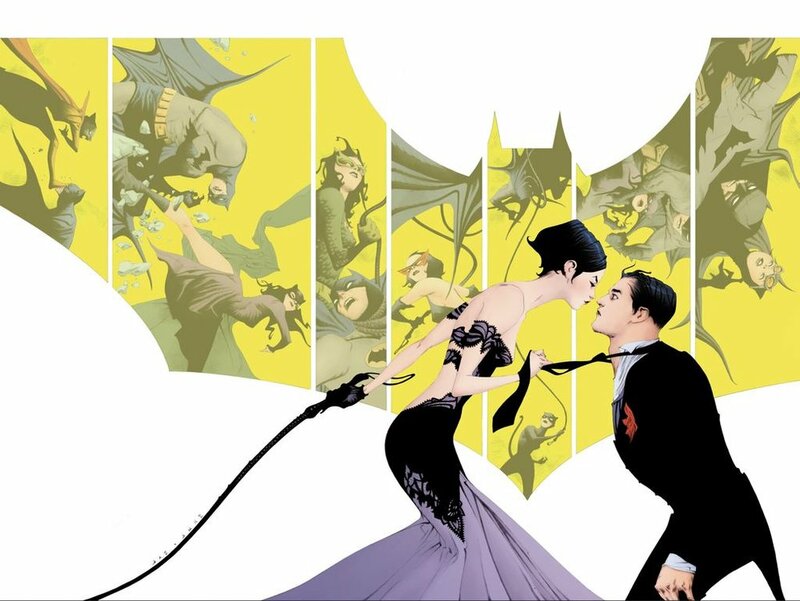 Batman #50 was a good comic with a messy release (the above variant cover is by Jae Lee). Let’s start with a mess: Batman #50 and the spoiler fiasco. I didn’t get spoiled (thankfully), but I’m sympathetic to all who did. Regardless, this was a fine issue with a welcome twist, especially if as Tom King says, this is the run’s halfway point. Have you all read IDW’s Black Crown imprint? You should. July saw the end of two early titles: Assassanistas and Punks Not Dead. Put simply, what a glorious wave of odd books, heavy on craft, humor, subversion. Can’t wait to see what Black Crown does next. The darling of this year’s Eisners, Monstress, wrapped its third arc with a thundering crescendo and the most action in any single issue since the book’s debut. Perhaps most importantly, Monstress #18 also laid great track for future stories. Very well done. Jeff Lemire and Dustin Nguyen concluded their sci-book Descender, a beautiful watercolor epic about childhood friendship. This issue was great (like the entire series), but it was less a finale than a continuation, setting up a sequel called Ascender that launches this fall. Al Ewing and Joe Bennett continue to make The Hulk terrifying. In Immortal Hulk #2 and #3, Al Ewing and Joe Bennett continued to strike a horrifying tone, telling a story closer to prestige horror than standard superheroics, leading to half of comics Twitter saying I don’t usually like the Hulk but I like THIS. There’s a reason Incognegro by Mat Johnson and Warren Pleece is taught in schools: it’s a well-done historical mystery steeped in questions about race. Its sequel wrapped this month with Incognegro Renaissance #5, a worthy successor. Sideways #6 gives its teen hero a defining tragedy, and ho man did it sting. Speaking of The New Age of DC Heroes, The Unexpected #2 and Terrifics #5 were both great too. Apparently Warren Ellis and Jon Davis-Hunt’s phenomenal new take on old characters, The Wild Storm, is selling well (at least online), but not enough fans are talking about it. I wish that would change. It’s so good. Finally, Flash #50 was an emotionally-satisfying conclusion to a long-simmering plot thread, one that also featured that page with the return of that character at the end. Cates & Stegman seem bent on a character-defining run. I don’t want to go into the plot, except to note there’s an expert connection to Jason Aaron’s all-time great run on Thor, and that superhero comic fans love that type of thing. There’s also just a feeling of excitement around everything Cates is writing; he’s like an athlete having his first MVP season, entrenching himself as a lead voice at Marvel, even extending his exclusive with the publisher. Which is all great, as is Venom #4. It’s still relatively early in this run, but Cates and Stegman have talked about doing a prolonged and character-defining stretch on this book. Also, like Immortal Hulk, this is another book that seems to have many fans reading a character they otherwise wouldn’t. No easy feat. Wasted Space, the frenetic space opera about addiction and cultism and 100 other things, just keeps getting better. People who write about comics often use that line, but in this case it’s true. Wasted Space is a complex comic with so many big ideas that the experience of reading it improves as more of its scope becomes visible. That’s been my experience, anyway. I loved Wasted Space #3 (read my review of Wasted Space #3). The ideas and plotting that made the series so engrossing is still here, but this issue also (organically) ups the humor, especially when the big all-powerful gigantic enemy guy tells some rando he’d feel better about himself if he approached work with pride—hilarious. I don’t know if I can be clearer: you should all be reading this book. Bold design choices elevate Gideon Falls to lofty creative levels. Holy wow, the art in this comic is insane. I know that’s vague and non-descriptive, but if you’ve read it, you’re absolutely nodding along. The truth is it’s hard to to describe these visuals without using dude, did you see that language. The art is imaginative to the point one wonders exactly when Andrea Sorrentino disregarded conventions and straight up started doing whatever he wanted. There are bold choices, to be sure, every one of which pays off, including red circles around details for emphasis, and arrows telling readers where to look. It could come off as proscriptive, but given how engrossing this story is, it instead feels helpful. I’ve liked this comic from the start (see my long-ago review of Gideon Falls #1), but Gideon Falls #5 somehow reaches new levels of creativity, storytelling, and absolutely bananas visual stimulation on every page. Absolutely bananas. With Wonder Woman #51, Steve Orlando and Laura Braga tell a stand-alone story with a deep and nuanced understanding of this character, one that shows exactly why she’s been relevant all these years. It’s the type of small-scale story that plays to a hero’s essence, the type done ad nauseum with Batman and Superman but not nearly as much with Wonder Woman. This comic, however, helps to fix that. It’s just so perfect. Aside from the adept characterization, it features an engaging and emotional narrative that speaks to Diana’s core values. It sounds cliche, but I teared up here at the drama and and smiled at the jokes. This is, to me, an issue we’ll be hearing new creators talk about on podcasts 10 years from now, citing it as an influence for the way they write/think about the character. Read our review of Wonder Woman #51. Nothing will ever be the same. If you’ve read the issue, check out Why Saga #54 Hurts So Bad. If you haven’t, please read the issue and then click that link. There’s just no good way to discuss this without spoilers. Simply put, though, we’ll just note that this is the most consequential issue yet in the best series in comics. That does it for our July list. Please check back to the site tomorrow for our new feature, Five Questions With Creators, which is being kicked off with writer Zack Kaplan, of Eclipse, Port of Earth, and Lost City Explorers! Check out our Best New #1 Comics of July 2018 here plus more of our monthly lists here . Zack Quaintance is a journalist who also writes fiction and makes comics. Find him on Twitter at @zackquaintance. He lives in Sacramento, CA.